If you are the Oneplus one user and unlocked the bootloader of your device, rooted and install the Custom recovery on it. You then realise you’ve got an issue with the phone and forgot to make a backup of your stock ROM. 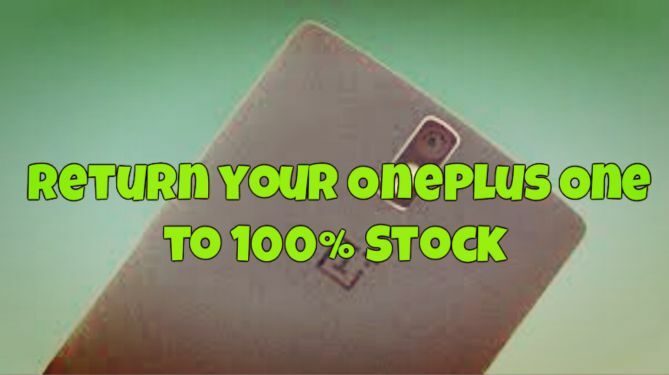 Don’t worry today in this guide we’ll show you how to you back to the100% stock on your rooted Oneplus one. In this guide we’ll show you how to flash the CM11s stock version, unroot the device and lock the bootloader again. This will reset the phone back to it’s out-the-box state, locked bootloader and all, running the latest cm-13.1-ZNH2KAS1KN build. To get started you need the ADb drivers and the Stock ROM XNPH38R build on your windows PC. The process is simple and take 15 to 20 minutes to complete the task. Before following this guide do take the full backup of your OnePlus one and follow the below mention steps one by one on your windows PC and One plus one. Step 1. Download the OnePlus One Toolkit here and install the same on your PC. Step 2. Download the the cm-13.1-ZNH2KAS1KN here and save it on your desktop. Step 3. Now connect your phone to the PC and run the Oneplus one tool kit and install the Adb Drivers first. Step 4. Once the drivers are installed on your windows PC. Now from the tool kit click on the “Flash” button. Step 5. Now form the next screen browse the cm-13.1-ZNH2KAS1KN file that you downloaded step 2. Step 6. 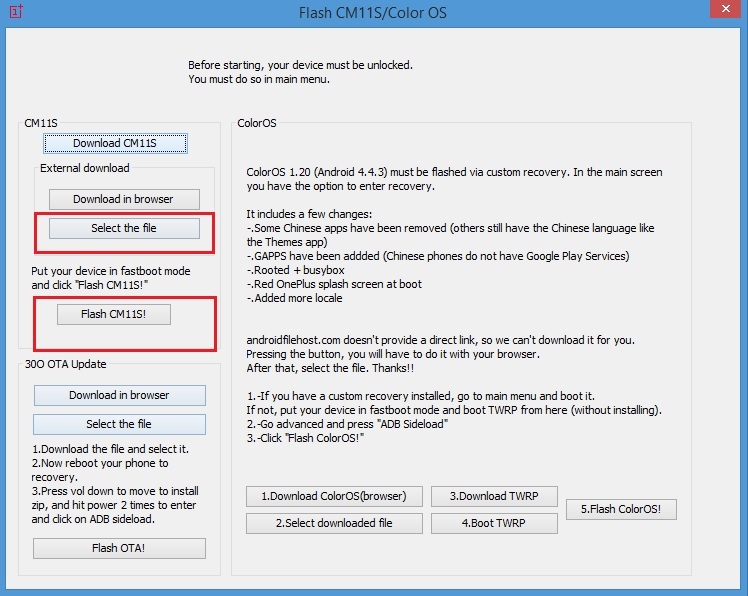 After that Click on the “Flash CM13” to start the flashing process. Now the flashing process will start on your phone. Once its completed your phone will reboot automatically and you device is running on the Stock CM13, also the phone is unrooted. Step 7. Now the next step is to lock the bootloader. 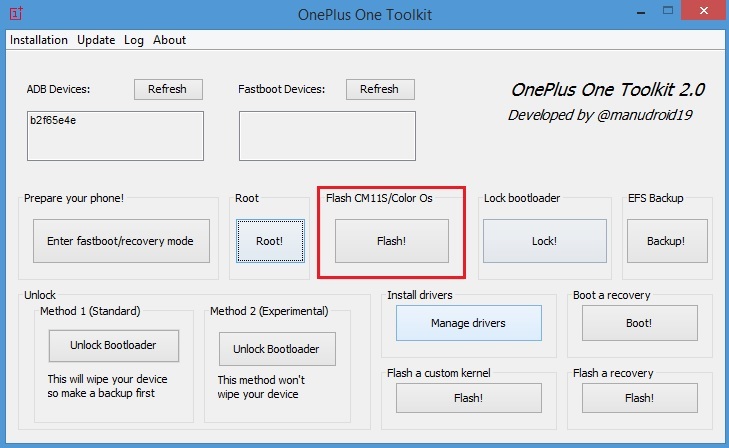 Again connect your phone to the PC and run the toolkit and this time click on the “Lock” button under the lock bootloader option to lock the booloader of OnePlus one. Reboot the phone and enjoy the Stock ROM on your OnePlus one.